In late December whilst attention was focused on Brexit the Government proposed to change the way it gives funding to councils. Instead of focusing on the most deprived areas or those with the most need they’ll introduce new funding models predominantly aiding more affluent Tory areas. This at a time when the Government should be reinvesting in our most at need areas not cutting them ever more to the bone. Tory cuts to local government are hitting Labour areas and the most deprived councils hardest, according to new Labour Party analysis. Local authorities’ spending power per household is on course to fall by an average of 23 per cent (£243) between 2010-11 and 2019-20. But Labour councils are set to see falls of 28 per cent on average, compared to a 19 per cent fall for Tory councils. This means that while Tory councils will see an average fall in spending power per household of £115 the equivalent cut for Labour councils is more than £500 per household – more than four times higher than Tory areas. The nine of the top 10 councils set to see the biggest cuts to spending power are Labour councils while eight out of 10 of the councils receiving the best settlement over the ten years are Conservative-controlled. In addition, the most deprived areas of the country are being hit particularly hard. Nine of the ten most deprived councils in the country have seen cuts of almost three times the national average cut of £255. Tameside Council’s spending power is £543.56 lower per household next year than it was in 2010, and Stockport Council’s is £317.73 lower. “Local government is under enormous pressure because of politically motivated Tory cuts that hit the poorest hardest and it’s set to get worse. 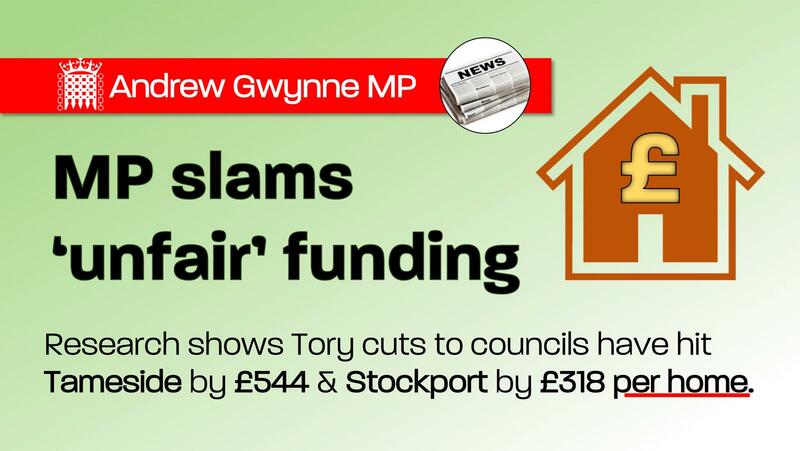 Ordinary families are paying the price as councils are forced to cut services to fill the gap. 1. On the 13th December 2018, the Ministry of Housing, Communities & Local Government released a consultation proposing changes to local government funding. 4. The analysis shows that between 2010 and 2020 Tory areas will have received a far lower reduction in spending power per household in both percentage and cash terms. 5. Biggest cuts in pounds per household – The nine out of ten of the areas seeing the biggest cuts to spending power per household in pounds are all Labour-controlled. 6. Smallest cuts in pounds per household- seven out of the 10 areas seeing the smallest cuts to spending power per household are Conservative-controlled. 7. Smallest cuts in pounds as a percentage per household – Nine out of the 10 areas seeing the smallest cuts to spending power per household in percentage are Tory-controlled. 8. The Tories are hitting the most deprived areas hard. Knowsley, the second most deprived area in the country has received the fourth biggest cuts of any council. 9. Cuts compared to deprivation ratings – Nine of the ten most deprived councils in the country have seen cuts of almost three times the national average cut of £243.